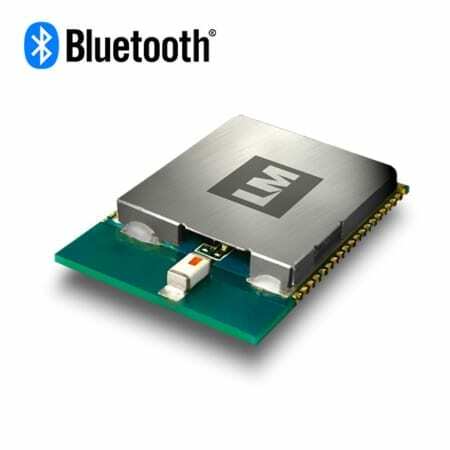 Bluetooth® Module Class 1 – LM072 is a an integrated module which runs LM’s own tried and tested Bluetooth® v2.1 or Bluetooth® v2.0 CSR Stack Firmware. With an 18dBm output from the RF terminal this powerful Bluetooth® Class 1 Module will cover distances beyond 100m when coupled with a well-tuned antenna circuit. The LM072 Bluetooth® v2.0, v2.1 data module provides a secure and reliable Bluetooth® connection. This wireless connection reaches a range of up to 100m in open space, with the option to add an antenna that suits your requirements e.g. a dipole and PCB antenna. The module acts as a standalone unit (i.e. no external MCU required) and/or can interface with embedded microcontrollers via UART. Peripheral devices can be directly controlled by the module to suit the user application. LM offers technical support to the developer and can create new user applications for the module. The AT Command set makes configuration of the firmware simple. The developed firmware and settings can be preloaded to the module, simplifying the manufacturing and testing process. It’s SMT side and bottom pads allow easy integration into your embedded system.